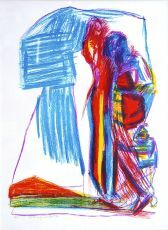 Petrus Johannes (Pieter) Defesche (Maastricht, 22 April 1921-Ulestraten, 13 July 1998) was a Dutch visual artist. After studying at the Middelbare Kunstnijverheidsschool in Maastricht, he went to the Rijksacademie van Beeldende Kunsten in Amsterdam. He was strongly inspired by Heinrich Campendonk who was a teacher at the Rijksacademie. 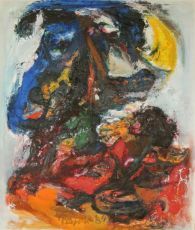 Defesche was a fellow student of Karel Appel and... Read morePetrus Johannes (Pieter) Defesche (Maastricht, 22 April 1921-Ulestraten, 13 July 1998) was a Dutch visual artist. After studying at the Middelbare Kunstnijverheidsschool in Maastricht, he went to the Rijksacademie van Beeldende Kunsten in Amsterdam. He was strongly inspired by Heinrich Campendonk who was a teacher at the Rijksacademie. Defesche was a fellow student of Karel Appel and Corneille. 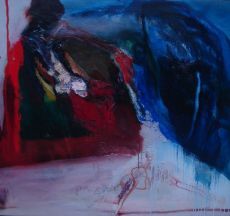 He mainly painted landscapes, still lifes and Christian subjects in an expressionistic style, bordering on the abstract. He also created collages, murals, settings and costumes. Defesche belongs to, along with Ger Lataster, Jef Diederen, Lei Molin, Pierre van Soest, Jan Stekelenburg, Frans Nols and Harry op de Laak, the group of artists, known as “de Amsterdamse Limburgers”. In 1949 he was honoured with the Prix de Rome and in 1964 he was awarded the Europaprijs voor Schilderkunst van de Stad Oostende. His work is included in the collection of Museum van Bommel van Dam in Venlo.